Venter Institute researchers have made the first viable cell with a synthetic genome. 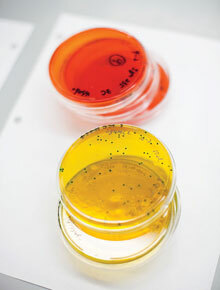 A solution of cells, some of which contain the new genome, is mixed with a gel-based culture medium that contains an antibiotic. Then it's poured into petri dishes and put into an incubator. Only cells containing the synthetic genome carry a gene that protects them from the anti­biotic. The blue spots are colonies of bacteria now controlled by the transplanted synthetic genome. With a precise motion, Li Ma, a technician at the J. Craig Venter Institute in Rockville, MD, pipettes a cherry-red solution of bacterial cells into a vial that contains a clear solution of fragile DNA loops. These loops, the largest pieces of DNA ever assembled in the lab, are each capable of controlling all the ordinary functions of a cell. But the DNA didn't originate in any bacteria: instead, scientists pieced it together from bottled chemicals. The process they recently developed for doing this is the first to yield synthetic cells that are capable of surviving. Some of the bacterial cells that Ma is working with will fuse together in the solution, engulfing the synthetic genome and then replicating and living under its control. Conventional genetic engineering is a lengthy process in which genes are altered one by one, often over successive generations of organisms. That makes radically changing a genome a daunting proposition. But the newly developed techniques allow researchers to edit genomes on a computer, subtracting or adding genes by literally cutting and pasting them in a file. It's more like word processing than the traditional lab work involved in culturing and screening generations of organisms. The researchers can then perform the genetic equivalent of printing out the file, at which point they're able to transplant the result--a new genome--into existing cells. These steps dramatically speed up the engineering process; it might take just weeks to complete experiments that previously would have taken months or years. Ultimately, researchers want to use synthetic biology to design microbes that very efficiently produce vaccines, clean fuels, and other products. But they can't engineer new genomes from scratch, because they don't yet know enough about what genes and networks of genes are needed to sustain life and produce a desired product. "You might remove one gene and the cell lives; remove a second and it dies; then remove a third and it lives again," says ­Daniel ­Gibson, an associate professor at the institute. Thus, the Venter researchers are experimenting with the sequence of a naturally occurring genome. They hope to learn more about how genomes and cells work by rapidly deleting and adding genes in different combinations, incorporating the new genomes into cells, and then observing how those genomes function or fail to function. The process starts on the computer, where Gibson pulls up the genome of the bacterium Mycoplasma mycoides. It's a relatively simple one, comprising just 1,078,809 DNA base pairs that make up about 900 genes. (In comparison, E. coli bacteria have about 4,400 genes.) Gibson and his colleagues have made a few changes: they've deleted 14 genes from the sequence and added others. To create a watermark distinguishing their creation, they developed a code that converts English into the four-letter alphabet of DNA and used it to modify the genome, incorporating their names, a URL, a few sentences, and an e-mail address into the genome. 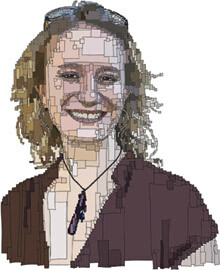 Gibson's group then uses software to divide the modified genome into 1,100 sections, each about 1,080 base pairs long--a size that can be made economically with a DNA synthesizer, a machine that pieces together stretches of DNA from individual base pairs supplied in bottled solutions. Finally, the researchers enlist yeast cells to stitch these long sections together, a job that machines can't do. Gibson kneels in front of a refrigerator in the lab and pulls out 12 plastic boxes, each of which contains 96 wells full of DNA fragments based on the computer-modified designs. He stacks them on a bench and says, "This is the entire genome in 1,100 pieces." ­Gibson uses a pipette to gather 10 fragments in order and adds them to a tiny plastic tube, along with an additional fragment of DNA that will help pull the sequence together into a loop. Next he adds yeast cells that have been treated to allow them to take up the DNA pieces. "Each yeast cell thinks these pieces of DNA are part of its own chromosome, and it's broken," he says. "It wants to put them back together." The researchers designed the DNA fragments so that the ones to be linked together have ends with matching sequences. The yeast pieces the 10 fragments together by matching these sequences to produce DNA loops that are each 10,000 base pairs long. Repeating the process links the 10,000-base-pair sequences to form 100,000-base-pair segments of the genome. After a third pooling step, the yeast have stitched together the entire synthetic genome. Using established methods, the synthetic genomes are extracted from the yeast. Handling the extracted DNA takes considerable care: even a small genome is a gigantic, fragile molecule. "It's going to break into 100 pieces if you just look at it wrong," Gibson says. If it were suspended in a liquid solution, the DNA could be destroyed merely by the movement of the liquid. So Gibson immobilizes the genomes in agarose, an algae-derived gel commonly used as a medium for microbes. Enclosed in this protective pellet, they can safely be stored until the researchers are ready to transplant them into recipient cells. In a lab down the hall, Ma has prepared the cells that will receive the new sequence: a species of bacteria called Mycoplasma capricolum that's closely related to the species from which the synthetic genome is derived. While an enzyme that degrades agarose liquefies DNA-containing pellets in one test tube, Ma gets another test tube and mixes the bacteria with calcium chloride and polyethylene glycol, a cocktail that the researchers believe makes the cells' surfaces malleable and sticky. Now it's a matter of chance and a steady hand. Ma pipettes some of the cell mixture into the vial containing the synthetic genome loops. The sticky cells begin fusing with one another. To maintain their spherical shape after fusion, they must take in volume from the solution around them. As this happens, some cells--about one in 100,000--also take in the synthetic genome. The result is a sort of supercell with three genomes--the synthetic genome and one from each of the two cells. The supercell then divides into three smaller cells, one of which contains the synthetic genome. Ma smears the cell solution on culture plates containing an antibiotic to which only cells with the synthetic genome are resistant (during the genome editing process, the researchers added a gene that makes them impervious to it). Those cells will live, growing and dividing under the control of the new genome. The rest die off, leaving behind a pure colony of synthetic cells. The next step for the Venter Institute researchers is to use their genomic editing, synthesizing, and transplanting techniques to design and test genomes with fewer and fewer genes. The goal is to create a "minimal" cell--one with only the genes it needs to survive. Such a cell could be easier than a natural one to alter through genetic engineering. The researchers' methods are currently very expensive: it costs $300,000 to $500,000 to make and transplant a synthetic genome if the researchers synthesize the DNA in house, or about three times that much if they purchase it from an outside supplier. Yet the price of DNA synthesis is falling and may continue to decline even further as demand increases and technology improves. If that happens and the genome-building techniques prove as useful as the Venter researchers hope they will, more people will begin to adopt their methods, says James ­Collins, a professor of biomedical engineering at Boston University. "This is a significant advance for synthetic biology," Collins says. "Now we've got to see, what are the changes that can be introduced to the genome?" It's been buzzed about for years, but Virgin Galactic is now officially selling tickets to space (or, space, if you prefer). The price is the expected $200,000, which you can get book either through Virgin or an "accredited space agent." Wait, what? There's not a lot of info on who or what these space agents are; Virgin's site only says, "They have been specially selected and trained by us to handle all aspects of your spaceflight reservation," and clicking on the space-agent booking link doesn't take you anywhere. If common sense is any guide, they're probably some kind of glorified travel agent, though presumably one that can answer space-specific travel questions like how likely you are to vomit, how the trip compares to Xtraordinary Adventures' $95,000 ticket to space, and what sort of Star Fleet insignia to wear. 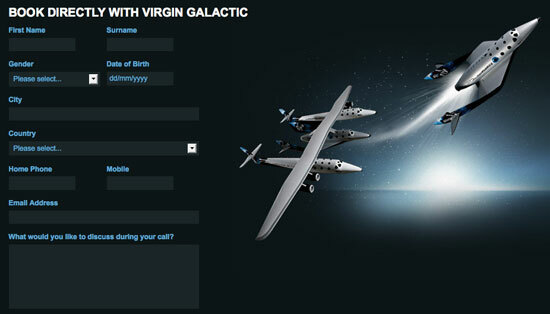 Book now with Virgin Galactic! There are airplanes and swimming pools that give prospective astronauts a taste of what a zero-gravity environment will feel like, but the sensations that they will feel upon returning from such an environment are also important to simulate. Astronauts coming back to Earth’s gravity often experience disturbances in their vision and neurological function, to the point that they can have trouble walking, keeping their balance, or even safely landing their spacecraft. 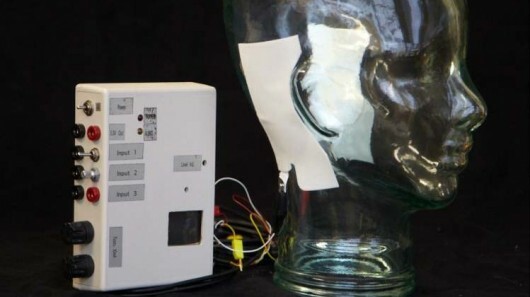 By utilizing a Galvanic vestibular stimulation (GVS) system, however, scientists can give them a sneak peek of what to expect, so they can better compensate for it when it happens in the field. The system was developed by Dr. Steven Moore of the National Space Biomedical Research Institute (NSBRI). It consists of a small box, which sends a 5 milliamp current to electrodes placed behind the subjects’ ears. Those electrodes deliver electricity through the skin to the vestibular nerve, which in turn sends signals to the brain that result in sensorimotor disturbances. Because the box is portable, subjects can carry it with them while attempting to walk – no doubt a big hit at the NSBRI’s office parties. Moore tried his system out on 12 test subjects at the NASA Ames Research Center in Moffett Field, California. Each subject flew 16 simulated shuttle landings, half of those landings with the GVS and half without. He compared the results to data collected from over 100 shuttle landings. Subjects using the GVS, he concluded, experienced disturbances similar to those experienced by shuttle pilots on actual flights. Without the GVS, subjects tended to land the shuttle at a simulated speed of 204 knots, which is right on target. With the GVS, the average speed increased to around 210 knots, which is at the upper limit of the safety zone. Likewise, GVS-using subjects also had more difficulty performing a routine landing approach braking maneuver that required them to bring the craft from a 20-degree glideslope angle to a 1.5-degree angle. 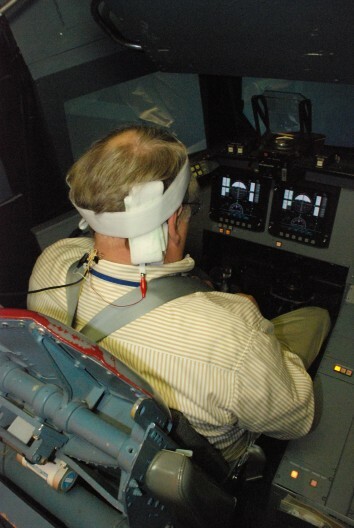 This is a point in real shuttle flights at which pilots often experience sensorimotor disturbances. Moore stated that his system could be used as an analog for other space vehicles and operations, and that it could even be used to prepare people with vestibular disorders for the effects following surgery. The NSBRI research team is now trying to determine if people can adapt to the effects of the GVS over multiple sessions.